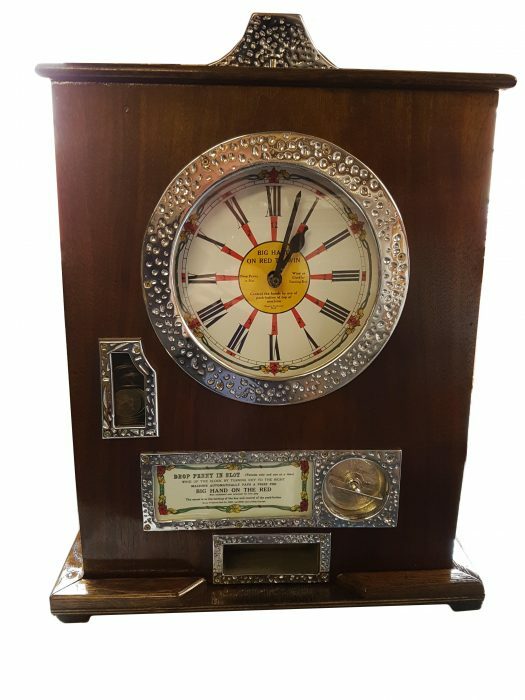 The Clock became a mainstay of the Bryans Works, selling in large numbers from its introduction (as the Sixwin Clock) in 1930, up until the 1970s. It was one of the few all-British games which offered some of the appeal of the proscribed one arm bandits. It is a pure gambling machine. The 'skill button' applies some braking to the spindle, but no effective control; it was just a sop to the Gaming Board. The game is a fruit machine in disguise. The three reels are replaced by two hands, the fruit symbols by Roman numerals and the handle by a key, creating the innocuous appearance of a clock. Insert a penny, wind up with the key and watch time fly, accompanied by the clanking of Bryan's unique inertial escapement timing mechanism. If the big hand lands on a number, you win the indicated amount. If the two hands land on 12 o'clock, twelve pennies plus the jackpot is paid. This is a rear-opening example. Later versions offered operator setting of payouts, front opening access to the mechanism and auto load jackpots. The mechanisms are exceptionally well built and robust.